There's no getting away from the fact that motherboards seem to be a tad expensive these days, but like cars they're very often just equipped with a ton more tech, which inevitably leads to higher prices. There's USB 3.1, M.2 ports, the latest Wi-Fi standards, RGB lighting, etc. - they all add to asking prices, and finding a happy medium can be tricky, especially as you dip below £150 where things start to get very price-sensitive. 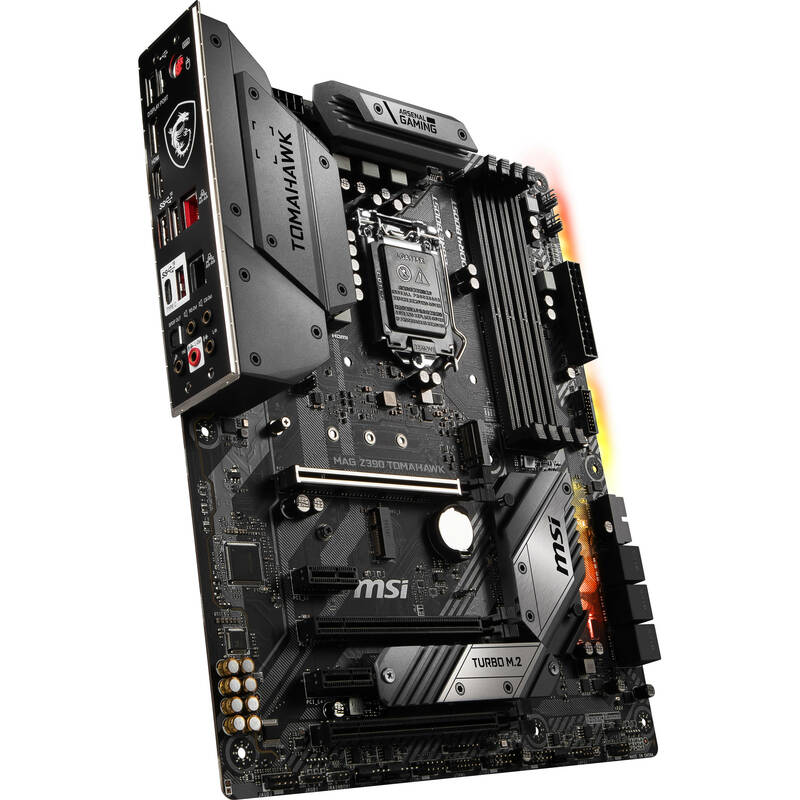 The MSI MAG Z390 Tomahawk is slap-bang in the middle of all of this being the cheapest Z390 board we've reviewed so far. So what, if any, corners have been cut to get there? In the flesh the board appears to lack very little and actually sports some surprisingly premium features. You get an integrated I/O shield (thanks for listening, MSI! ), M.2 heatsink, reasonably beefy power circuitry with equally substantial heatsinks for the price, plus an I/O shroud and a smattering of RGB lighting. For £150 that sounds fairly cut and dried in terms of a recommendation, and for the most part that's true. There's no onboard Wi-Fi, but you do at least get a dinky Key E M.2 slot that supports Intel's Wireless-AC cards, although there's nowhere to mount the antennas for this on the board itself, which seems to be a bit of an oversight seeing as most other boards with the configuration include the usual screw-on antenna mounts (plus the necessary card pre-installed). As such, if you're dead-set on an M.2 Wi-Fi option and not a USB dongle, you'll need to purchase an M.2 Wi-Fi card that includes the necessary parts to mount its antennas or even purchase compatible parts separately. A post from a user on Intel's forums suggests this is harder than it may first sound, especially as the official response from Intel is that it may even be illegal to do this depending on your region. What's equally strange is that the board includes dual Intel Gigabit LAN ports - we'd much rather have seen a mount for Wi-Fi antennas here instead of an extra LAN port. As such, this feature is largely pointless, and we would advise the use of a PCIe adaptor card instead. We have asked MSI to clarify why this feature was added to the board, but so far we haven't heard back. Despite M.2 Wi-Fi oddities, the M.2 storage options are at least spot-on, with MSI sensibly locating the single M.2 heatsink at the base of the motherboard so it can make use of the extra case airflow usually present in this area and not risk being blasted by GPU airflow. Both slots support either PCIe 3.0 x4 or SATA 6Gbps M.2 SSDs, but the heatsink can only be mounted onto that bottom slot - that's the one you should be using if you have a typical single GPU setup anyway, so the design makes sense. The rest of the PCB is fairly standard, with the usual six SATA 6Gbps ports plus USB 2.0 and 3.0 headers, but sadly no USB 3.1 Type-C header. Thankfully, cases that use the latter are still rare and often pricey, making them unlikely pairings with the motherboard we're looking at here. The M.2 heatsink is large and substantial. Being located at the bottom of the board, it can sit in line with your case fans with no graphics cards or DIMM slots in the way, and there's a lot of space underneath your SSD too, which should mean it doesn't hamper cooling on the underside of the SSD too much either. Below you can see the integrated I/O shield and the somewhat limited array of USB ports with just five Type-A ports in total. However, you do get full-fat Z390-powered USB 3.1 Type-A (three in fact!) and Type-C ports as well as two display outputs - useful for troubleshooting - plus the full array of audio outputs. The onboard audio sadly isn't Realtek's flagship ALC1220 but rather ALC892, but this isn't likely to worry most people in this price range, and you need decent ears and audio equipment to hear a difference anyway.